When Culpeper's Drop It! The Healthy Living and Weight Loss Challenge 2013 wrapped up Thursday it had produced a total of over $300,000 in donations to Germanna's Nursing and Health Technologies programs since the annual event began in 2010, according to GCC Educational Foundation Director Mike Catell. Joe and Linda Daniel and the Culpeper Regional Health System have donated funds toward Germanna’s nursing and health programs since the beginning. Joe Daniel is president at Culpeper Wood Preservers and a member of the GCC Educational Foundation Board. The couple donates $20 to Germanna for each pound lost. This year's total of 2,502 pounds lost works out to a $50,040 donation. CRHS donates $30 a pound to health care programs. Some of that $30 has gone to Germanna in the past. No announcement has been made about that yet for this year. He said there’s no way to measure the long-term impact. .
Linda Daniel said: "I worked in the health profession for almost 40 years. I think health is so essential to keeping your whole mental outlook and your emotional outlook as well as your physical well being and we all want to get older and better and stay healthy and the best way to do it is to move and keep involved in a program like this." Germanna President David A. Sam said the college is grateful. “We want to thank the Daniels for their long term support for Germanna in many ways, especially the nursing program and health care programs,” Dr. Sam said. “Thanks in large part to them, Germanna now graduates two RN classes a year in December and in May. “The support you give us is instrumental in terms of scholarships,” Dr. Sam said. He said the Daniels’ generosity has made it possible to buy equipment, including high-tech human simulators used in Germanna’s Virtual Hospital. “We also deeply appreciate the long partnership with Culpeper Regional Hospital and Culpeper Regional Health Care System.They provide clinical instruction, clinical sites. They’ve contributed $1 milllion over the years to our programs.” . Startup Weekend Fredericksburg has free, sponsored slots for Germanna Community College students, faculty and staff. For more information, email Christine at cgoody2shoes@yahoo.com. The event, which helps fledgling entrepeneurs launch companies, is set to begin with pitches at 5:30 p.m. Friday, June 7 at Germanna Community College’s Workforce Development and Technology Center on its Fredericksburg Area Campus in Spotsylvania and culminate in the best startup ideas being chosen Sunday, June 9 and the event ending at 9:30 p.m.
Christine Goodwin, CEO and co-founder of WishStars, an online platform that brings corporate donors and educators together, was tabbed in December for one of the Center for Innovative Technology’s GAP 50 Entrepreneur Awards. She lives in Locust Grove and is a graduate of Spotsylvania High School and what was then Mary Washington College. Goodwin credits WishStars taking off to her experience at a Startup Weekend in Reston last year. Startup Weekend is a global organization with a mission to inspire, educate, and empower individuals, teams and communities. she said. To date, there have been 1,068 Startup Weekend events held in 478 cities around the world and from these events over 8,000 startups have been created. Goodwin said that for the rest of the participants, Startup Weekend is an opportunity to get experience that enhances creative and critical problem -solving, to try new skills, and to get expert instruction on new methods of brainstorming. WHO ATTENDS A STARTUP WEEKEND? All attendees will have a chance to network with some amazing people in their fields and in other fields and experience first-hand all of the dimensions of innovation in one event. WHY DO A STARTUP WEEKEND IN FREDERICKSBURG? Virginia has the highest concentration of information technology skilled and professional services people of any place in the country - and the many of them live in our region, she said. “We have within 150 miles of the Fredericksburg region the highest concentration of universities and colleges of anywhere on the planet. Our greatest resource in this area is the incredibly talented human capital we have. And yet every day, we send more than 15,000 of them into Northern Virginia and D.C. to work. Too many people have resigned themselves to accept that to live here they must spend 12-14 hours a day five days a week getting to and from work in the worst traffic in the country. WHY HOLD THE EVENT AT GERMANNA? 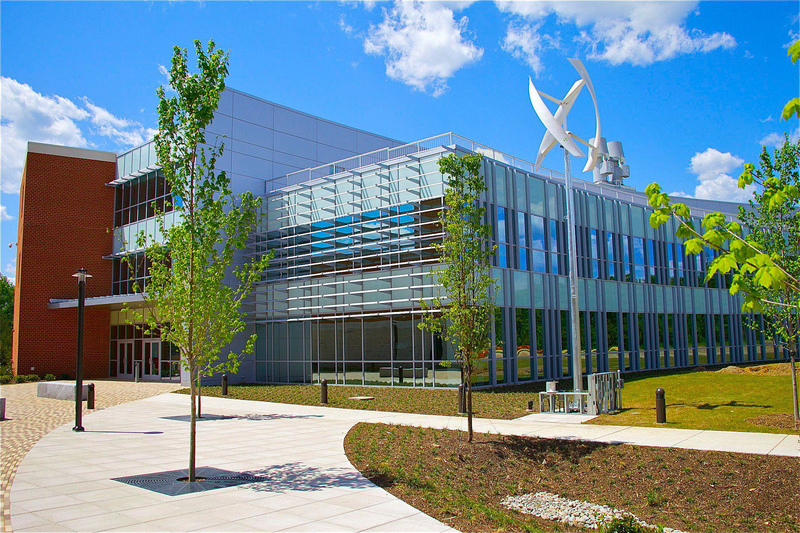 “We have the facilities and support, and we work closely with the business community, so it’s a good fit,” said Germanna Center for Workforce and Community Education Interim Vice President Martha O’Keefe. 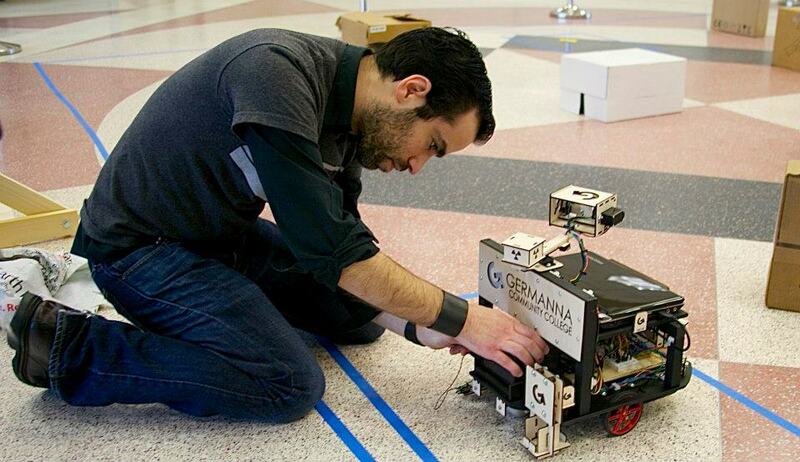 Germanna is one of the sponsors of Startup Weekend Fredericksburg. She said GCC’s Center for Workforce provides training and professional development for the region’s business community, including courses and programs supporting small businesses. And, she pointed out, two-year college degree are available, also meeting the needs of businesses in our service region. “People who are considering either pitching or who are just curious about a SUW event and are on the fence should know that if they don’t register, they’ll be missing a great opportunity to get plugged in to, network with, and benefit from the experience of our amazing line up of judges and coaches,” Goodwin said. Goodwin said those interested in starting up businesses can't get the level of personal, one on one interaction, feedback, and networking from any other event for $100. Students should attend class, even if they are not officially registered for that class. Class registration will resume when Internet service is available. Faculty must pay close attention to the accuracy of their class rosters and maintain manual attendance logs as needed. Interactive video classes can continue as scheduled, in spite of Internet outages. The Germanna Testing Centers are closed temporarily. Routine service will resume when the technical services are stabilized. Access to library resources will be severely limited during periods of internet outages. · E-2 messages will be sent with updates as they become available. Labels: ' Germanna Community College', classes, Culpeper, Fredericksburg, outage, payment, registration, Stafford, Va. Her mother passed away when she was 5. She says her father couldn’t take care of her, so at age 12, she moved to Birmingham, Ala. to live with her grandmother, Sylvia Branch. She wasn’t happy about the move, but what seemed to be a storm cloud had a silver lining. “It was my teachers in Alabama who really turned me on to math,” she says. Her life had taken a turn for the better thanks to her grandmother. So it rankled her when, as a child, she would see shady mechanics take advantage of her grandmother, charging her a lot and refusing to explain what was wrong. “My grandmother always got the short end of the stick,” she says. As a child, she had seen a need and addressed that need. That’s what engineers do. So it should come as no surprise that she’s done the same as a faculty member at Germanna. Until now, Germanna’s Associate of Science degree in Engineering program focused on mechanical engineering and engineering science. Dr. Hammond said that one of the primary concerned voiced during last year’s Germanna Center for Workforce Advisory Board meeting, was a skills gap that existed when it came to filling electrical engineering jobs. Earlier this year she did some research and found that more job openings were listed for electrical engineers across Virginia than for mechanical engineers. Seeing a need, she pushed to add a concentration in electrical engineering at Germanna. And she succeeded. Things are coming together nicely for the GCC engineering program, which has a beautiful, cutting edge new Science & Engineering Building at Germanna’s Fredericksburg Area Campus in Spotsylvania. She earned her bachelor’s degree at Auburn University, her master’s degree at the University of California-Irvine and her Ph.D. at the University of Alabama. In a manner of speaking, she has her own “fix it children” now. Dr. Hammond is the faculty advisor for GCC's Applied Engineering Club. In the spring of 2013, the club built a robot "with the Fukushuma power plant meltdown disaster in mind.” It has the ability to navigate into areas too dangerous and restricting to send personnel. It uses two onboard cameras that allow both a forward-tilting view and a 310-degree pan and tilt view to “see.” It's able to manipulate instruments from 10 inches away with its probe, drop remote sensors and retrieve sensors. It’s compact, weighing about nine pounds with no dimension greater than 14.25 inches. Club members use an Xbox controller to operate it via a Wi-Fi connection with an indoor range of 230 feet and virtually unlimited range when connected over the Internet. It uses a laser guidance system and has a top speed of 1.56 miles per hour. 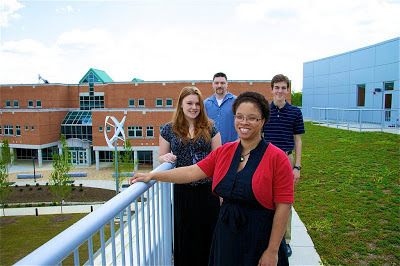 Germanna Applied Engineering Club's D.R.O.I.D. robot. The club and D.R.O.I.D. made a strong showing at this Spring’s ASME Student Professional Development Conference at the University of Virginia, finishing second in student design for D.R.O.I.D., second in Web page design by Tristan Jones, second in Poster Presentation by Andrew Hallet and fourth for an oral presentation by Brian Keefer. A Germanna “MeCANical” engineering team led by Dr. Hammond won the Engineering Ingenuity award during a recent contest sponsored by Stafford County Schools and 99.3 The Vibe. 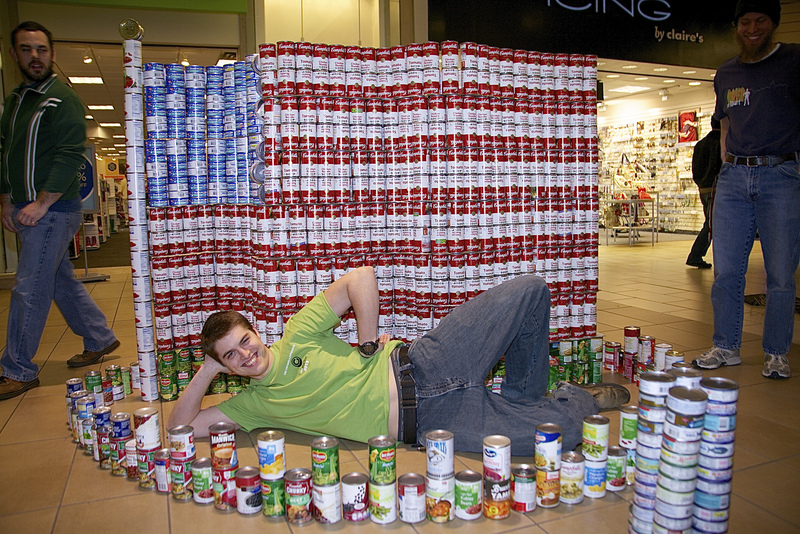 Ten teams collected thousands of cans of food for the Fredericksburg Food Bank, and then built structures at Spotsylvania Towne Center. The Germanna Engineering students came up with an American flag design. 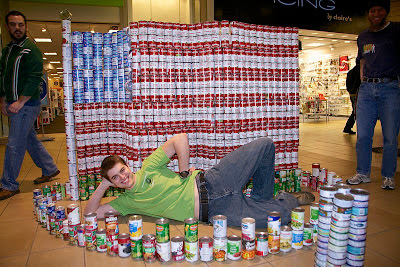 Now all the cans go to feed area families in need. "Silver Linings" design won an award and helped the hungry. When the group had to submit a name for their structure, it didn’t know what it was going to build. So Prof. Hammond jotted down “Silver Linings.” She says that popped into her head because being sent to live with her grandmother led to her becoming a PhD teaching engineering at Germanna and because of the silver colored trim of the cans of food donated for the project. Prof. Hammond is justifiably proud of her students. Add to that, Prof. Hammond says, the fact that most Germanna engineering students have jobs while trying to master a difficult program, and it’s satisfying to see them succeed.” They’re very serious about their studies. They’re coming into class after a full day of work. Some have retail jobs, but with the knowledge they possess, they’re very close to what you need for a professional job. Don't fall behind. Germanna Tutoring Services will help you race ahead. Many new Germanna students are getting a jump start on their college education by enrolling in classes this summer. It’s important to be aware of the abundance of free academic support services available. Since most summer classes proceed at an accelerated pace, students should seek tutoring assistance through our Tutoring Services at the first sign that they need additional instructional assistance. Students can schedule appointments for individual tutoring appointments by calling or visiting the Locust Grove or Fredericksburg Tutoring Centers or by submitting an appointment request directly from the Tutoring website. Students at the Daniel and Stafford Centers may call our offices to schedule tutoring sessions via Blackboard Collaborate. Walk-in assistance is also available in our Writing and Math Center at the Fredericksburg and Locust Grove campuses. Please refer to the Tutoring Services Web page for specific hours. If students are unable to visit the Locust Grove or Fredericksburg Tutoring Centers, they may be interested in participating in online tutoring sessions through Smarthinking. Enrolled students have already been pre-registered for Smarthinking, so they may participate in “live” tutoring sessions or submit their writing assignments for review to the essay center. As students prepare for placement tests, write research papers, or complete homework assignments, please let them know that there are many helpful handouts available to them from the Tutoring Centers or from the tutoring website. Students can also access over 4,000 Khan Academy videos from the tutoring Web page in subjects ranging from algebra and statistics to economics and physics. Tutoring appointments may be made here. 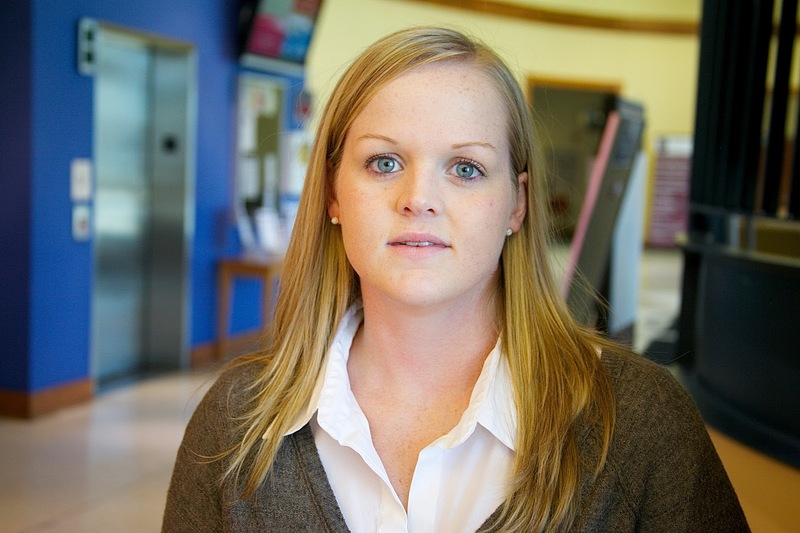 Germanna Community College's new Student Veterans Support Counselor understands what it's like to be deployed during Operation Enduring Freedom in Afghanistan. He understands what it's like to make the transition from active duty to civilian life. He understands the emotional turmoil many veterans face in making that kind of transition. And he understands veterans' frustration in dealing with the red tape that too often tangles their efforts to get the benefits they've earned. Robert M. Dixon, a Westminster, Md. native who lives in Stafford County, had a 22-year career in the U.S. Army, serving during the Gulf War as part of Operation Desert Storm and as part of Operation Enduring Freedom in Afghanistan. He retired as a lieutenant colonel. He said that during his Army career and two years as a civilian working at Quantico he developed a respect for other branches of the service including the Marines, Navy and Air Force. His last assignment was serving on the Army’s Suicide Prevention Task Force. “One of my duties there was to serve on an interdisciplinary team to try to identify [reasons for] the spike in suicides in active duty and reserve members as well as to come up with some integrated approaches as to how we might reduce those numbers,” Dixon said. Dixon said the NIH, the CDC and the Department of Defense have been studying the increased rate of suicides among active duty military personnel and veterans. The U.S. Department of Veterans Affairs has set up a crisis line for vets in urgent need of mental health care at 1/800/273-8255, press 1. Reports say it’s harder to track the total number of veteran suicides than those of active duty military members, but there is concern that the number may be climbing. And some fear the worst years may lie ahead as the U.S. draws down its forces in Afghanistan. He said one of the difficulties the military faces in dealing with the problem is reluctance on the part of many in the military to seek help for mental health problems like depression, anxiety and PTSD. “When you’re dealing with the veteran’s population, there’s a certain stigma attached,” Dixon said. Germanna and the Rappahannock Area Community Services Board recently signed an agreement to ease and expand student access to mental health services for all its students, including veterans. ”This agreement will help our counseling staff provide better crisis intervention and referral service to students in need of mental health assessment and treatment. 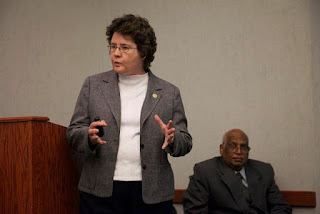 I’m looking forward to working closely with RACSB staff to develop a plan to address mental health crises and provide access to the RACSB Emergency Services Program,” said Pam Frederick, Germanna Dean of Student Development. Dixon said we can all help in addressing the situation. Dixon said it’s impossible to say exactly how many veterans are students at Germanna, because only those receiving VA benefits are identified as such. Dixon said the major concern for most students who are veterans is “the timely delivery of benefits that they count on not only for tuition, but for housing.” Many also have anxiety about returning to the classroom environment again after the military. He believes his experience as a veteran using VA benefits has provided him with a background that can benefit student veterans experiencing problems with benefits and access to veteran resources to help them with their transition back to civilian life. Questions regarding eligibility for education benefits or VA policies and procedures may also be directed to the Department of Veterans Affairs at 1-888-442-4551 or http://www.gibill.va.gov. GCC Student Veterans Support Counselor Robert Dixon may be reached at Germanna at 540-891-3023 or rdixon@germanna.edu. RICHMOND — The State Board for Community Colleges established the 2013-2014 in-state tuition and mandatory fees rate at $130 per credit hour at its regular May meeting. Beginning this fall in-state students will pay an additional $5.50 per credit hour, which means the cost of a typical three-hour class will increase by $16.50 and the cost of a full-time load of classes for the year will increase by $165. The approved 4.4 percent increase will allow Virginia’s Community Colleges to expand science, technology, engineering and mathematics, and health science (STEM-H) programs. It will increase the percentage of courses taught by full-time faculty from 45 percent to 47.5 percent – a level not seen throughout the VCCS since 2005. The increase will also fund the colleges’ portion of employee salary increases and higher health insurance costs. “This tuition decision balances our priorities of access and quality. It permits Virginia’s Community Colleges to advance its long-held goal of hiring more full-time faculty members and offering more science and technology programs, which are expensive to offer, while adhering to our public promise of affordability,” said Hank W. Chao, chair of the State Board for Community Colleges. 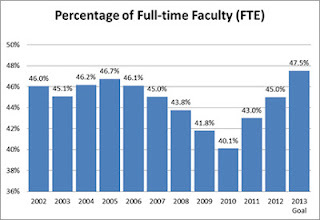 This chart depicts the fall semester credit hours taught by full-time VCCS faculty members from 2002 through 2012 and includes the goal for 2013. 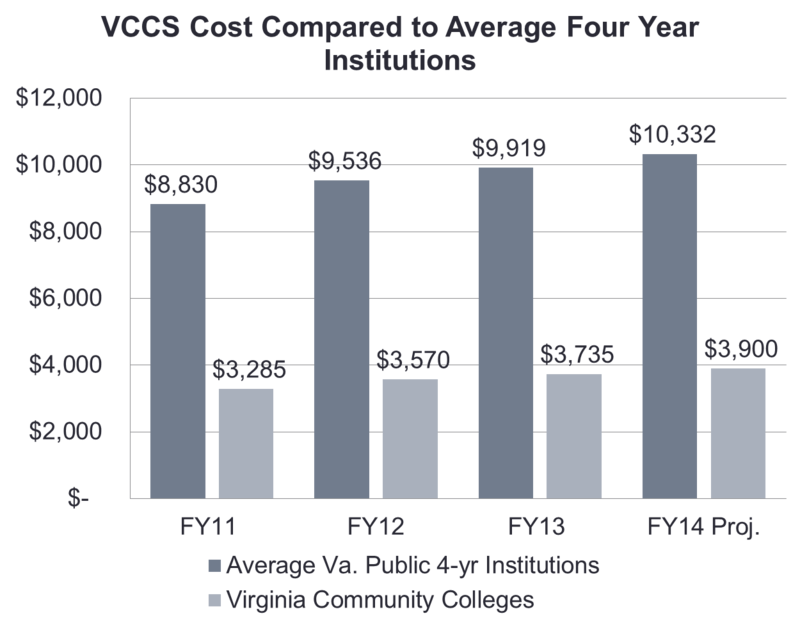 The board’s tuition decision is in accord with Achieve 2015, the VCCS six-year strategic plan that calls for keeping community college tuition and fee rates at one-half or less than that of the comparable rates at Virginia’s four-year universities. 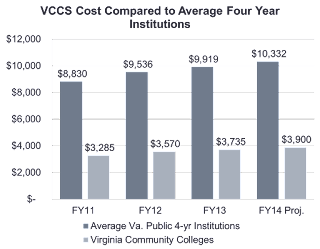 Currently, tuition and mandatory fees at Virginia’s Community Colleges are just over one-third (37.6 percent) of the average of comparable tuition and fees charged by Virginia’s public four-year institutions. The State Board also agreed to increase the tuition differential rate for Northern Virginia Community College by $2.00 per credit hour. Even with the differential, NVCC’s tuition remains the lowest among comparable colleges in the Washington, D.C. metro area. Further, the board approved an increase of $1.00 per credit hour to the tuition differential rate for J. Sargeant Reynolds, Tidewater, Thomas Nelson and Virginia Western community colleges. Tidewater Community College will offset that tuition differential with a $1.00 decrease in its student activity fee. The tuition differential will help the included colleges attract and retain instructors in more competitive urban and suburban labor markets. The State Board increased the tuition rate for out-of-state students by $5.50 per credit hour to a total of $324.60 per credit hour. Out-of-state students make up approximately five percent of the total enrollment of Virginia’s Community Colleges. About Virginia’s Community Colleges: Created more than 40 years ago, the VCCS is comprised of 23 community colleges located on 40 campuses across the commonwealth. Together, Virginia’s Community Colleges serve more than 405,000 students a year. For more information, please visit myfuture.vccs.edu. Germanna Community College student Ulisses Santamaria, the son of immigrants from El Salvador, has always wanted to be a doctor—so much so that as a child he became his own first patient. “I’ve always had a thing for medicine,” he says. “Even as a kid, if I was kind of my own doctor. If I had cuts or bruises, I’d fix them myself. I was pulling my own teeth out when they were ready. I pulled out the last [baby tooth] when I was 9 years old. He has worked as a volunteer at the Spotsylvania Regional Medical Center, mostly in the emergency room. Now the 18-year-old Spotsylvania County native has become one of the early success stories for Germanna Community College’s new Experiential Learning internship program. Through the program Ulisses has landed an internship at the National Institute for Health. He will be mentored by Dr. Alon Poleg-Polsky in research involving the structure and function of the retina at the National Institute of Neurological Disease and Stroke in Bethesda. The work will involve investigation into how the retina performs preliminary image processing and transmits visual information to the brain. His father immigrated from El Salvador in 1989 to escape a civil war there. His mother followed a year later. Ulisses is the first member of his immediate family to go to college. His father works as a home renovator. 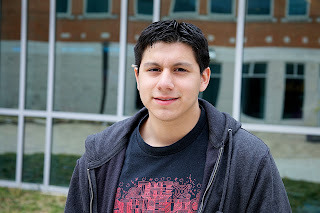 Ulisses is the first member of his immediate family to go to college. He credits Gary Brightbill, an 8th grade science teacher at Battlefield Middle School who was honored as one of Spotsylvania County’s best teachers for 2013, for piquing his interest in science. “He set off the spark,” Ulisses says. Faculty members at Germanna have fanned that spark into a flame, he says. Prof. Witt said: "Ulisses is an excellent student ... His love of life and enthusiasm for science is contagious. He was a pleasure to have in class." Cheri Ober, Germanna’s internship program coordinator, says Ulissis has been working his way through college by delivering pizzas. This summer the paid NIH internship will give him the chance to earn money doing work related to his career goal for the first time, she says. The public is invited to attend the upcoming meeting of the Germanna Community College Board on Thursday, May 16, 2013, at 5 p.m. The meeting will take place in Room 100 at the college’s Locust Grove Campus at 2130 Germanna Highway in Orange County. A sign-up sheet will be made available 30 minutes prior to the beginning of the meeting for those interested in addressing the board. Germanna Community College is a two-year, public institution of higher education, serving a total headcount of about 14,000 in the counties of Caroline, Culpeper, King George, Madison, Orange, Spotsylvania, Stafford and the city of Fredericksburg. 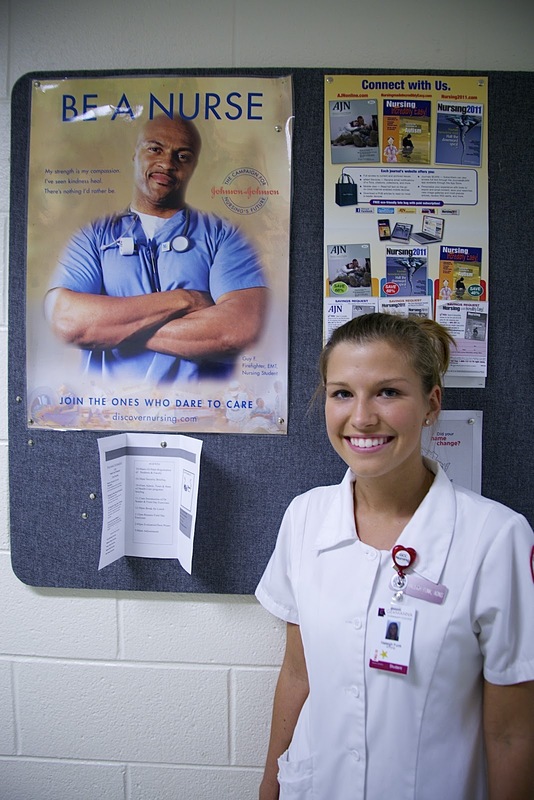 Her father’s battle with cancer started Haleigh Funk on her way to becoming a nurse. Funk’s father, 47-year-old Brian Funk, recovered and is doing well. But Haleigh Funk didn’t forget the experience. At 18, she completed Germanna Community College’s Practical Nursing program at Eastern View High School in Culpeper and became an LPN. At 19, she graduated from Germanna’s Registered Nursing program on Thursday, May 8 at the Fredericksburg Expo Center. A total of 562 students were to receive 981 associate’s degrees and certificates. “The sky is the limit for this talented young woman,” Germanna Dean of Nursing and Health Technologies Mary Gilkey said. She hopes to work at Culpeper Regional Hospital, plans to eventually get her bachelor’s degree and would like to specialize in geriatric nurse. 2013 Spring Commencement keynote speaker Virginia Van Valzah: From learning disabilities to an "addiction to learning"
The determined 26-year-old has battled ADHD and dyslexia since she was a child. When she enrolled at Germanna Community College, she applied advice from one of her teachers at James Monroe High School to break courses down into easily digestible chunks and spend a lot of time in the Tutoring Center. “Class sizes at Germanna are small enough that you get that one-on-one attention you need to thrive,” she says. After earning her associate’s degree at Germanna in 2006, she went on to a bachelor’s in administrative justice at George Mason University in 2008 and a post bachelor’s certificate and master’s in criminal justice at Virginia Commonwealth University in 2011. Using flash cards to study, she compiled a 3.7 grade point average at VCU. She’s now a court security deputy for the Stafford County Sheriff’s Office and a training officer. This summer, she will begin teaching criminology at Germanna as an adjunct faculty member. “I’m addicted to learning and I’m trying to pass on my addiction to other people,” she says. As a training officer, she‘s already helped students one-on-one who might have struggled without that attention. She grew up in Spotsylvania, Stafford and Fredericksburg. She currently lives in downtown Fredericksburg. Her mother, Cathy Van Valzah, has been a history teacher for over 25 years at Brooke Point High School in Stafford. Her father, Stuart Van Valzah, is an accountant who owns his own business. Labels: 'Germanna Community College', 'learning disabilities, 'Virginia Van Valzah', 2013, commencement, Fredericksburg, Va.